For obvious reasons, a lot of projects have been on hold in the region of Iran over the past few years. One such project is the Bid Boland II Gas Processing Project, to be constructed in the Khusestan Province in South Western Iran. Although awarded to EIED (Energy Industries, Engineering & Design) in November 2007, the project has been on hold three times and a new owner, the Persian Gulf Petrochemical Company, revived the project in 2015. This allowed the engineers of Bronswerk (BHT) to redesign a part of the process in such a way that serious reductions of plot space, material and operational costs could be realised, a substantial advantage of involving BHT when changes like the ones explained in this article can still be made. This multi-billion Euro project consists of a refinery with a processing capacity of 57 million m3/ day of sour and sweet gases from four Gas & NGL lants in the region. Additionally it includes 600km of feed and product pipelines, an export terminal in Mahshahr and a 600 unit residential camp plus industrial and non-industrial buildings and related facilities. The production capacity of the refinery consists of 15 billion m3/year sweet gas, 1.48 million ton/year ethane, 1.51 million ton/year LPG and 0.86 million ton/year NGL. This project is characterised by vast dimensions and big numbers, where any alternative solution in terms of plot space, energy consumption or weight reduction has the potential to translate into an enormous positive impact on the overall capital investment and also the operational costs of this project. The new owner has taken this opportunity to search for such alternative solutions with regards to the shell and tube heat exchangers of the Bid Boland gas treating plant. As mentioned, this project is characterised by vast dimensions and big numbers. The plant consists of four trains, each train responsible for processing the sour and sweet gasses into sweet gas, ethane, LPG and NGL. Zooming in on the shell and tube heat exchangers, the original design consisted of four treated gas coolers, four inlet gas coolers and one gas heater per train. All together, these 36 heat exchangers amounted to a combined weight of 1,704,400kg. Just imagine the plot space they would have taken up, the energy consumption required, the costs for the materials needed to fabricate them, installation and spares for maintenance, the costs of transportation and the impact on the environment. 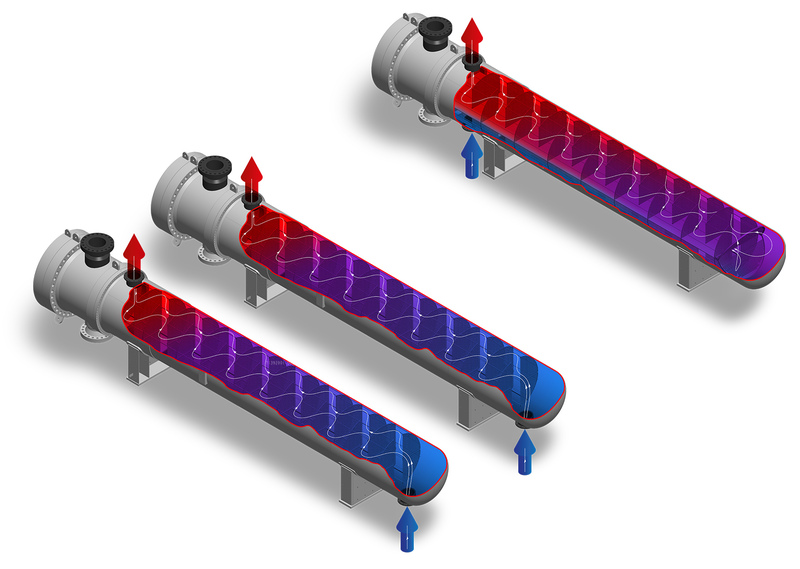 The three heat exchangers are the treated gas cooler, cooling the gas after the treatment, the inlet gas cooler, cooling the gas before it enters the next phase in the process and the gas heater that is situated in a later stage in the process, for heating the gas before entering the condensate drum. Because of the scope of this project, alternative solutions can have an enormous impact. Luckily the new owner was very interested in alternative solutions and decided to grant BHT the chance to do so for the thermal and mechanical design, purchasing of materials, manufacturing, inspection, pressurising and delivery of the before-mentioned heat exchangers. BHT’s engineers are trained to optimise the design, taking the overall process into consideration. For the gas heater design no significant savings in the thermal design could be realised. However the design could be optimised by changing the nozzle locations. Instead of radial nozzles, axial nozzles were used. This reduces the overall plot space and weight of the channels. Secondly all welding was eliminated by use of a forged channel. See the image on the right for comparison between design from datasheet and the new design. The benefits are less material, no welding, hence no welding docs were required and a minimal non destructive examination (NDE). For BHT the lead-time was reduced significantly and risks during project execution minimised. Most importantly, this solution results in considerable client benefits – most importantly, higher integrity due to weldless design, but also less plot space, less weight for transport and foundation) and less weight to handle during maintenance. 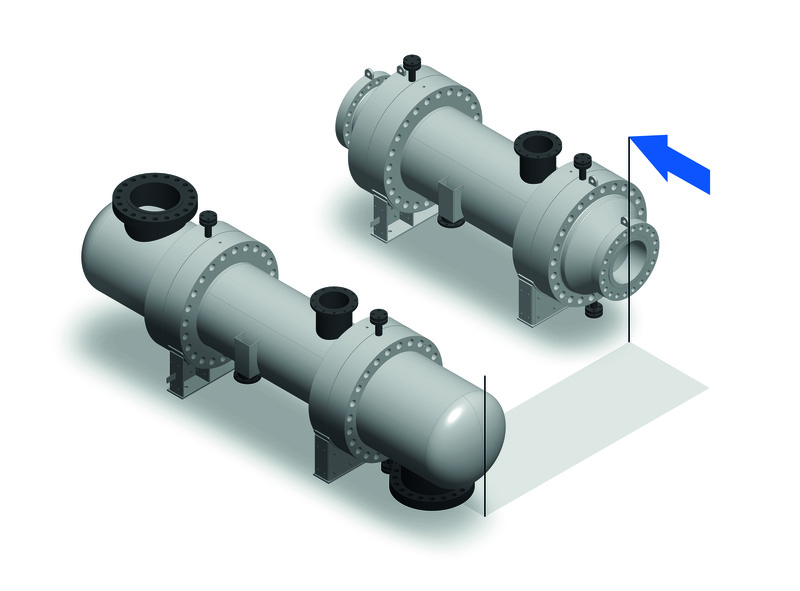 All of these heat exchangers are vibration free and have a complete thermal guarantee. Since the market in Iran opened up again, a lot of projects that have been on hold for a long time, are being revived. These kind of projects (in Iran or anywhere else for that matter) create a lot of opportunities for both plant owners and operation managers. They might, for instance, take the chance to have another look at the cost of ownership ofthe plant, in terms of energy consumption and maintenance requirements, but also the capital investment in terms of material and plot space being used. A company such as BHT loves to take up such a challenge. The above case study highlights what the result of such an endeavour can be. In this particular scenario, the number – and more importantly the total weight and plot space – have been reduced dramatically. Especially for the inlet gas cooler and the treated gas cooler, these changes will have an impact on the total layout of the plant, since the trains no longer consist of four heat exchangers per train, but just two. And the major impact of the gas heater is, as mentioned before, the higher integrity due to the weldless design. These outcomes of smarter design are directly translated into advantages for both the plant owner and the plant manager. Femke Schaefer is with Bronswerk (BHT).